Whatever lifts the corners of your mouth, trust that. There is a candle in your heart, ready to be kindled. 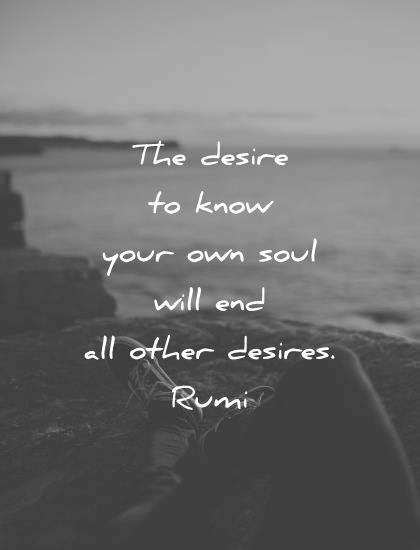 There is a void in your soul, ready to be filled. You feel it, don’t you? By God, when you see your beauty you will be the idol of yourself. The spirit is so near that you can’t see it! But reach for it… don’t be a jar, full of water, whose rim is always dry. Don’t be the rider who gallops all night and never sees the horse that is beneath him. Take someone who doesn’t keep score, who’s not looking to be richer, or afraid of losing, who has not the slightest interest even in his own personality: he’s free. Be full of sorrow, that you may become hill of joy; weep, that you may break into laughter. Very little grows on jagged rock. Be ground. Be crumbled, so wild flowers will come up where you are. Life is balance of holding on and letting go. See also: Why is Rumi the best-selling poet in the US? Be empty of worrying. Think of who created thought. Become the sky. Take an axe to the prison wall. Escape. Be drunk with love, for love is all that exists. Be an empty page, untouched by words. The wealth within you, your essence, is your kingdom. There is a life-force within your soul, seek that life. There is a gem in the mountain of your body, seek that mine. O traveller, if you are in search of that, don’t look outside, look inside yourself and seek that. With every breath, I plant the seeds of devotion, I am a farmer of the heart. Achieve some perfection yourself, so that you may not fall into sorrow by seeing the perfection in others. Start a huge, foolish project, like Noah… it makes absolutely no difference what people think of you. Seek the wisdom that will untie your knot. Seek the path that demands your whole being. Whoever has heart’s doors wide open, could see the sun itself in every atom. You are not one you are a thousand. Just light your lantern. Lovers have heartaches that can’t be cured by drugs or sleep, or games, but only by seeing their beloved. I lost my hat while gazing at the moon, and then I lost my mind. I have neither a soul nor a body, for I come from the very Soul of all souls. Beyond the rightness or wrongness of things there is a field, I’ll meet you there. Every need brings what’s needed. Pain bears its cure like a child. Having nothing produces provisions. Ask a difficult question, and the marvelous answer appears. The soul has been given its own ears to hear things mind does not understand. Discard yourself and thereby regain yourself. Spread the trap of humility and ensnare love. All that you think is rain is not. Behind the veil angels sometimes weep. Wisdom tells us we are not worthy; love tells us we are. My life flows between the two. My words are like a ship, and the sea is their meaning. Come to me and I will take you to the depths of spirit. I will meet you there. The world is a mountain, in which your words are echoed back to you. All your anxiety is because of your desire for harmony. Seek disharmony, then you will gain peace. Anything which is more than our necessity is poison. It may be power, wealth, hunger, ego, greed, laziness, love, ambition, hate or anything. In their seeking, wisdom and madness are one and the same. On the path of love, friend and stranger are one and the same. Clean out your ears, don’t listen for what you already know. O, happy the soul that saw its own faults. Peaceful is the one who’s not concerned with having more or less. Unbound by name and fame, he is free from sorrow from the world and mostly from himself. Two there are who are never satisfied – the lover of the world and the lover of knowledge. Your radiance shines in every atom of creation yet our petty desires keep it hidden. Everything about yesterday has gone with yesterday. Today, it is needed to say new things. You have within you more love than you could ever understand. When I am with you, we stay up all night. When you’re not here, I can’t go to sleep. There is no salvation for the soul but to fall in love. Only lovers can escape out of these two worlds. This is what love does and continues to do. It tastes like honey to adults and milk to children. If you love someone, you are always joined with them – in joy, in absence, in solitude, in strife. Now I am sober and there’s only the hangover and the memory of love. Caught by our own thoughts, we worry about everything. Do not worry if all the candles in the world flicker and die. We have the spark that starts the fire. This being human is a guest house. Every morning is a new arrival. A joy, a depression, a meanness, some momentary awareness comes as an unexpected visitor… Welcome and entertain them all. Treat each guest honorably. The dark thought, the shame, the malice, meet them at the door laughing, and invite them in. Be grateful for whoever comes, because each has been sent as a guide from beyond. When I run after what I think I want, my days are a furnace of distress and anxiety; If I sit in my own place of patience, what I need flows to me, and without any pain. From this I understand that what I want also wants me, is looking for me and attracting me. There is a great secret in this for anyone who can grasp it. There is a life in you, search that life, search the secret jewel in the mountain of your body. Oh soul, you worry too much. You have seen your own strength. You have seen your own beauty. You have seen your golden wings. Of anything less, why do you worry? You are in truth the soul, of the soul, of the soul. Oh! Joy for he who has escaped from this world of perfumes and color! For beyond these colors and these perfumes, these are other colors in the heart and the soul. Be grateful for your life, every detail of it, and your face will come to shine like a sun, and everyone who sees it will be made glad and peaceful. The illuminated life can happen now, in the moments left. Die to your ego, and become a true human being. Travelers, it is late. Life’s sun is going to set. During these brief days that you have strength, be quick and spare no effort of your wings. If destiny comes to help you, love will come to meet you. A life without love isn’t a life. Don’t make yourself miserable with what is to come or not to come. I learned that every mortal will taste death. But only some will taste life. With life as short as a half-taken breath, don’t plant anything but love. If you want money more than anything, you’ll be bought and sold your whole life. Listen to the unstruck sounds, and what sifts through that music. My heart, sit only with those who know and understand you. Be a helpful friend, and you will become a green tree with always new fruit, always deeper journeys into love. A warm, rainy day-this is how it feels when friends get together. Friend refreshes friend then, as flowers do each others, in a spring rain. If you are looking for a friend who is faultless, you will be friendless. Why struggle to open a door between us when the whole wall is an illusion? Friend, our closeness is this: anywhere you put your foot, feel me in the firmness under you. To me nothing in the world is as precious as a genuine smile, especially from a child. When a man makes up a story for his child, he becomes a father and a child together, listening. I am a child whose teacher is love surely my master won’t let me grow to be a fool. Whenever sorrow comes, be kind to it. For God has placed a pearl in sorrow’s hand. Sorrow prepares you for joy. It violently sweeps everything out of your house, so that new joy can find space to enter. It shakes the yellow leaves from the bough of your heart, so that fresh, green leaves can grow in their place. Sorrow… It pulls up the rotten roots, so that new roots hidden beneath have room to grow. Whatever sorrow shakes from your heart, far better things will take their place. Join the community of saints and know the delight of your own soul. Enter the ruins of your heart and learn the meaning of humility. Whoever finds love beneath hurt and grief disappears into emptiness with a thousand new disguises. Everyone is overridden by thoughts; that’s why they have so much heartache and sorrow. One of the marvels of the world: The sight of a soul sitting in prison with the key in its hand. Suffering is a gift; in its hidden mercy. Greed makes man blind and foolish, and makes him an easy prey for death. Do you pay regular visits to yourself? Start now. Prayer clears the mist and brings back peace to the soul. Do good to the people for the sake of God or for the peace of your own soul that you may always see what is pure and save your heart from the darkness of hate. If you could get rid of yourself just once, the secret of secrets would open to you. The face of the unknown, hidden beyond the universe would appear on the mirror of your perception. Make peace with the universe. Take joy in it. It will turn to gold. Resurrection will be now. Every moment, a new beauty. A little while alone in your room will prove more valuable than anything else that could ever be given you. A wealth you cannot imagine flows through you. Do not consider what strangers say. Be secluded in your secret heart-house, that bowl of silence. Stop, open up, surrender the beloved blind silence. Stay there until you see you’re looking at the light with infinite eyes. Whatever happens to you, don’t fall in despair. Even if all the doors are closed, a secret path will be there for you that no one knows. You can’t see it yet but so many paradises are at the end of this path…Be grateful! It is easy to thank after obtaining what you want, thank before having what you want. My dear heart, never think you are better than others. Listen to their sorrows with compassion. If you want peace, don’t harbor bad thoughts, do not gossip and don’t teach what you do not know. Everything is emptiness. Everything else, accidental. Emptiness brings peace to your loving. Everything else, disease. In this world of trickery, emptiness is what your soul wants. There is one way of breathing that is shameful and constricted. Then, there’s another way: a breath of love that takes you all the way to infinity. Today, let us swim wildly, joyously in gratitude. On a day when the wind is perfect, the sail just needs to open and the world is full of beauty. Today is such a day. The very center of your heart is where life begins. The most beautiful place on earth. You have forgotten the One who doesn’t care about ownership, who doesn’t try to turn a profit from every human exchange. Your light is more magnificent than sunrise or sunset. What hurts the soul? To live without tasting the water of its own essence. When water gets caught in habitual whirlpools, dig a way out through the bottom of the ocean. Daylight, full of small dancing particles and the one great turning, our souls are dancing with you, without feet, they dance. Can you see them when I whisper in your ear? You have no need to travel anywhere – journey within yourself. Enter a mine of rubies and bathe in the splendor of your own light. Wherever water flows, life flourishes: wherever tears fall, divine mercy is shown. How do I know who I am or where I am? How could a single wave locate itself in an ocean. I have found the heart and will never leave this house of light. Your task? To work with all the passion of your being to acquire an inner light. Truth lifts the heart, like water refreshes thirst. We rarely hear the inward music, but we’re all dancing to it nevertheless. Whosoever knoweth the power of the dance, dwelleth in God. Dancing is when you rise above both worlds, tearing your heart to pieces and giving up your soul. Without love, all worship is a burden, all dancing is a chore, all music is mere noise. A divine dance appears in the soul and the body at the time of peace and union. Anyone can learn the dance, just listen to the music. Be kind to yourself, dear – to our innocent follies. Forget any sounds or touch you knew that did not help you dance. You will come to see that all evolves us. Dance, and make joyous the love around you. Dance, and your veils which hide the Light shall swirl in a heap at your feet. We came whirling out of nothingness, scattering stars like dust… The stars made a circle, and in the middle, we dance. I am a drunkard from another kind of tavern. I dance to a silent tune. I am the symphony of stars. There are many ways to the Divine. I have chosen the ways of song, dance, and laughter. The Prophets accept all agony and trust it. For the water has never feared the fire. It is certain that an atom of goodness on the path of faith is never lost. On what is fear: Non-acceptance of uncertainty. If we accept that uncertainty, it becomes an adventure! When you go through a hard period, when everything seems to oppose you, when you feel you cannot even bear one more minute, never give up! Because it is the time and place that the course will divert! Those who don’t feel this love pulling them like a river, those who don’t drink dawn like a cup of springwater or take in sunset like a supper, those who don’t want to change, let them sleep. Always remember you are braver than you believe, stronger than you seem, smarter than you think and twice as beautiful as you’d ever imagined. If something makes you happy in this world, you should think of what will happen to you if that thing were taken away. The garden of the world has no limits except in your mind. Each moment contains a hundred messages from God. Touched. How did you get here? Close your eyes… and surrender! Love is the water of life. Everything other than love for the most beautiful God is agony of the spirit, though it be sugar-eating. What is agony of the spirit? To advance toward death without seizing hold of the water of life. To become spiritual, you must die to self, and come alive in the Lord. Only then will the mysteries of God fall from your lips. To die to self through self-discipline causes suffering but brings you everlasting life. Knock, and He’ll open the door. Vanish, and He’ll make you shine like the sun. Fall, and He’ll raise you to the heavens. Become nothing, and He’ll turn you into everything. 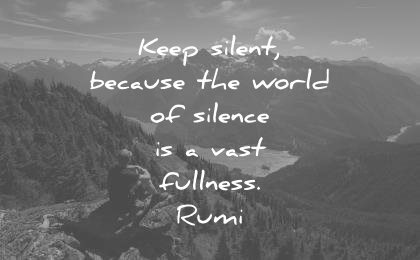 Sit quietly and listen for a voice that will say, “Be more silent.” As that happens, your soul starts to revive. Ways of worshipping are not to be ranked as better or worse than one another… It’s all praise, and it’s all right. We are all the same… all the same… longing to find our way back… back to the One… back to the only One! Why, when God’s world is so big, did you fall asleep in a prison, of all places? Stay in the spiritual fire. Let it cook you. All religions. All this singing. One song. Peace be with you. I am in the House of Mercy, and my heart is a place of prayer. Love came and became like blood in my body. It rushed through my veins and encircled my heart. I choose to love you in silence, for in silence I find no rejection. I choose to love you in loneliness, for in loneliness no one owns you but me. I choose to adore you from a distance. For distance will shield me from pain. I choose to kiss you in the wind, for the wind is gentler than my lips. I choose to hold you in my dreams, for me in dreams, you have no ends. I was a tiny bug. Now honored at the head. and made me a poet who sings about joy. Sometimes in order to help He makes us cry. Fortunate the heart that burns for His sake. Blessed are those who understand. Life blossoms wherever water flows. This is how it always is when I finish a poem. and I wonder why I ever thought to use language. beauty change children dance death deep depression emotional famous fear friendship funny god gratitude grief happiness hope images inspirational life light loss love marriage moon nature ocean pain peace poems quotes religion rumi sadness short silence spirituality strength sun trust water wisdom worrying. 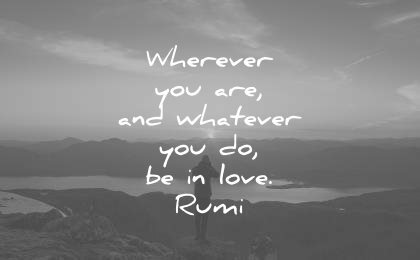 I love you Rumi. You are the soul I have been seeking. Thank you for blessing me with your wisdom. Thanks for your comment, Temwani! Been reading them since 2 hours. 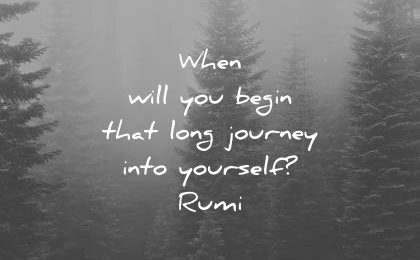 Rumi’s quotes are deep and sometimes I need to re-read them (2-3 times) to really understand them. Wow, Randy. Great quotes! Are those yours or Rumi’s? Thanks for all those quotes, Randy! He’s profound, poetic yet very effective and inspiring. Yes! 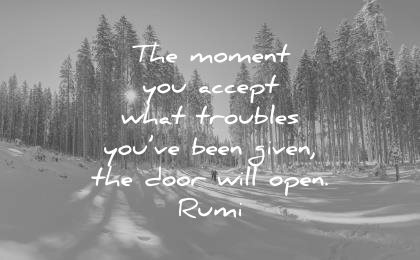 Rumi is such a amazing (and inspiring) poet. So much so that I decided I MUST create an article with him. Depth to the core…. He says what the heart wants to say but cannot express…. 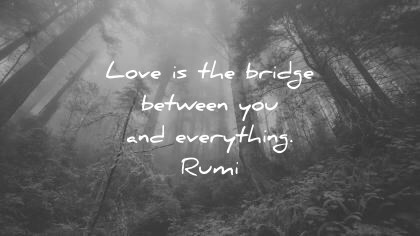 Yes, Rumi always finds a way to say, in simple words, what we feel deep inside. Thanks for sharing these amazing quotes. I must appreciate you and want you to keep it up. Sure, I’ll keep it up! 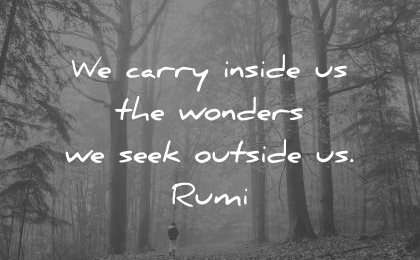 Yes, Rumi’s quotes are a masterpiece. 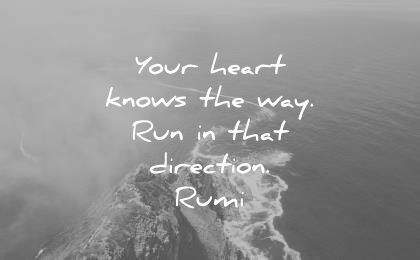 I wish I could follow Rumi. I just paint his verses on canvas but the fact is I don’t as I just select the size of canvas and colors rest I do not know how it happens all I see in the end a painting. Its not me its Him like Rumi said , ” I am like a brush in the hand of a painter. Thanks for sharing your page Zahid. Be a tree, let the dead leaves drop. Thank you for all the quotes. Thanks for your thoughts, Chen. 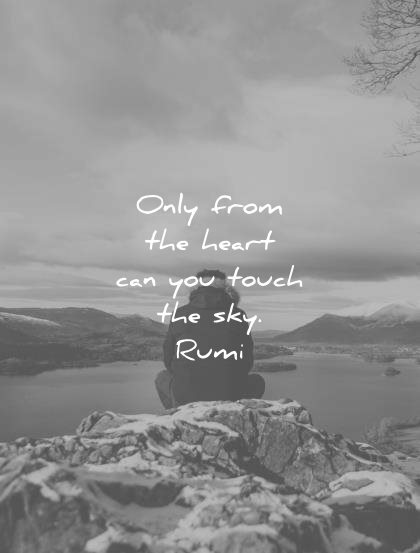 I love the great RUMI ….Excellent Work…Bunch of Thanks with LOVE…. Happy to see you liked it. 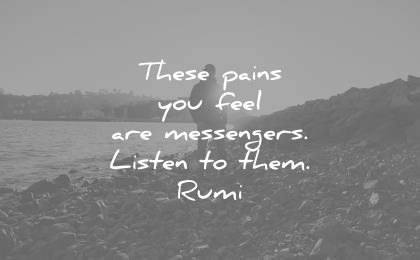 these pains are your messengers, listen to them. Every pain teaches us something. It’s hard to believe this at first (in the short term), but it always become true (in the long term). That’s a good one indeed. A short quote, but a deep one. Such beauty and truth shared on this website. Your energy is being spent wisely, elegantly, all for our illumination. 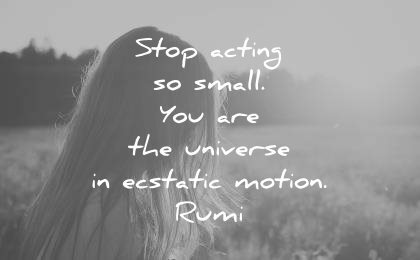 Thank you for keeping Rumi in our awareness. Thanks for your beautiful comment, Karen. Is there a rumi quote about scattering seeds of extravagant love…..? I am not this hair, I am not this skin, I am the soul that lives within. That’s my favourite. It’s indeed a good one! We are so much more than our appearances. The inner life, once discovered and nurtured, becomes a world in itself.